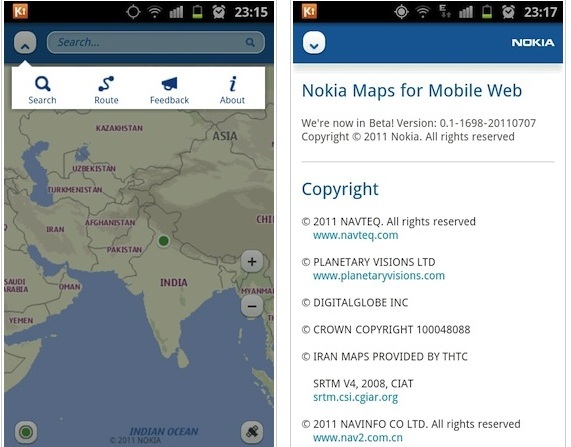 Vaibhav Sharma from thehandheldblog has noticed that Nokia Maps has been updated for mobile, though specifically for HTML5 browsers. Vaibhav demoes this on an Android and iOS handset. It’s NOT just a mobile site where desktop intended data is shrunk for mobile. It actually looks like an app, transitions included and all. You’d be hard pressed to say it was in browser at all. When I first read Vaibhav’s post, I was stunned at Nokia’s Maps app moving, not just beyond WP, but on Android and iOS. But for now it’s just browser based. What do you think of Nokia Maps on other platforms? Is this Nokia giving away strengths or the best way to extract value in Ovi/Nokia Maps, by getting it to more people?